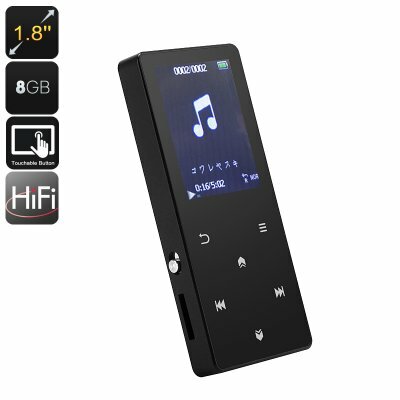 Successfully Added Bluetooth MP3 Player - HiFi Music, E-Book, Video, Pictures, Pedometer, Recording, 1.8-Inch Display, 400mAh, 8GB Memory, 16GB SD to your Shopping Cart. This Bluetooth MP3 player is a great multifunctional gizmo that comes packed with an abundance of features. It has 8GB internal storage and a 16GB SD card slot. This means that you’ll be able to store more than 60 hours of music on your MP3 player. Besides letting you listen to your favorite tracks, it also supports movies and images. Therefore, it offers you plenty of ways to stay entertained. With its powerful 400mAh battery, it lets you enjoy all its features for up to 20 hours. This is enough to get you through multiple days without needing to worry about your battery’s life. Hifi music quality lets you enjoy your favorite tracks to their absolute most. Besides supporting a wide-range of audio files, this MP3 player also comes with a regular FM radio. This feature lets you listen to the latest songs, news broadcasts, and live talk shows. Your Bluetooth MP3 player furthermore lets you record tracks and save them instantly. This offers you an easy and efficient way to expand your music collection. Besides letting you listen to music, it also supports E-books. Therefore, you can read stories from its 1.8-Inch display no matter where you’re at. Additionally, the gizmo features a pedometer that keeps track of your daily activity levels. It has a tough and durable body so you won’t have to worry about breaking it while using your gizmo during upcoming workout sessions. This Bluetooth MP3 Player comes with a 12 months warranty, brought to you by the leader in electronic devices as well as wholesale electronic gadgets..